Copyright: All Contest Winners grant the Sponsors the nonexclusive, worldwide, royalty-free, perpetual, unrestricted rights and license to modify and display the winning photos on the Contest Website and also use them in any medium and anywhere whatsoever for the promotion of this and future photo contests, and also to include the photographs in Encyclopædia Britannica Online. Submit your original photographs of nature taken anywhere in the world. Images of captive or pet or non-wild animals are not eligible and should not be submitted. Any photographs of animals must be taken in their natural environment without any interference by the photographer. Posed photographs are not permitted. Grand Prize – a check for $1000 and publication in Encyclopædia Britannica Online and a free one-year subscription to Encyclopædia Britannica Online. Ten Britannica Award prizes – a check for $75 plus publication in Encyclopædia Britannica Online and a free one-year subscription to Encyclopædia Britannica Online. Image requirements: digital color images only in JPG format; 72 ppi resolution; sized between 1000 and 1500 pixels on the longest side. No date/time stamp, no signature. 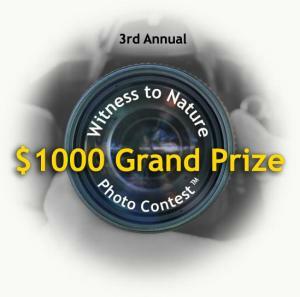 You may submit up to five photos online via the website. Selected photographers will be required to submit the original digital file.